The 2nd Mixer Board serves a dual function depending on transmit or receive. In the receive mode the 48.05Mhz IF signal from the Up-Converter Board is applied to the input of the 2nd Mixer Board. The injection signal for the mixer is the 53.696Mhz signal developed on the Pass-Band Tuning Board. The output of the mixer takes the difference of the two signals, the 5.645Mhz IF signal, filters and amplifies that signal and sends it to the Filter Board. In the transmit mode the process is reversed. The Mixer Board takes the 5.645Mhz transmit IF signal and mixes that with the 53.696Mhz injection signal from the Pass-Band Tuning Board. The board filters the difference of those two frequencies, and outputs the 48.05Mhz IF signal to the Up-Converter Board. This slot on the transceiver Parent Board accommodates two boards. If the accessory Noise Blanker Board is installed it provided both the IF switching function described here and performs the noise blanking function, described below. Pictured here is the IF Switching Board which is used if the Noise Blanker accessory in not installed in the radio. 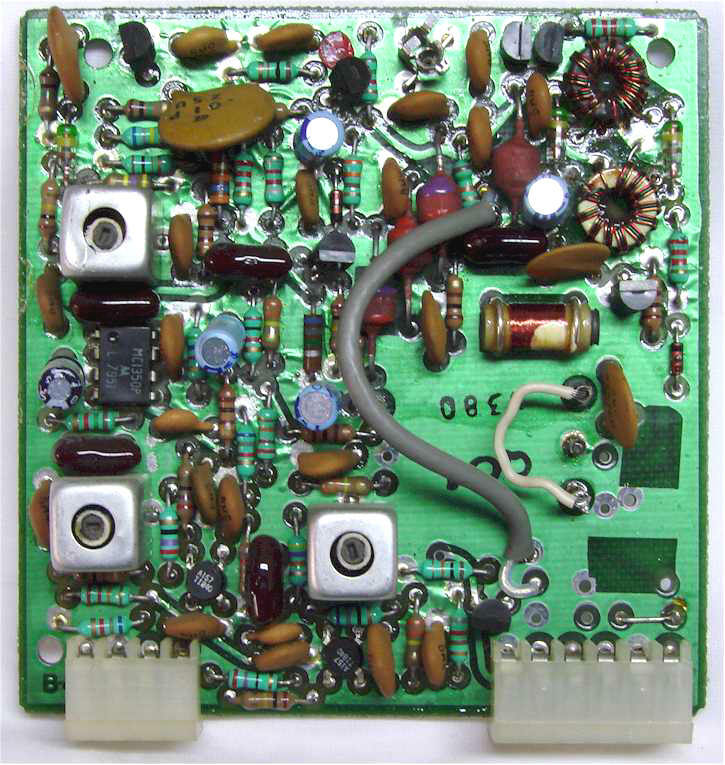 This board provides the transmit/receive switching for the 5.645Mhz IF signal. In the receive mode the 5.645Mhz from the 2ND Mixer Board is switched through this board to the IF Selectable Filter Board. In the transmit mode it takes the 5.645Mhz transmit IF signal from the Transmit Exciter Board and switches that to the 2nd Mixer Board. The Noise Blanker Board is an accessory which is a plug-in replacement for the IF Switch Board and also provides signal noise processing during receive mode. 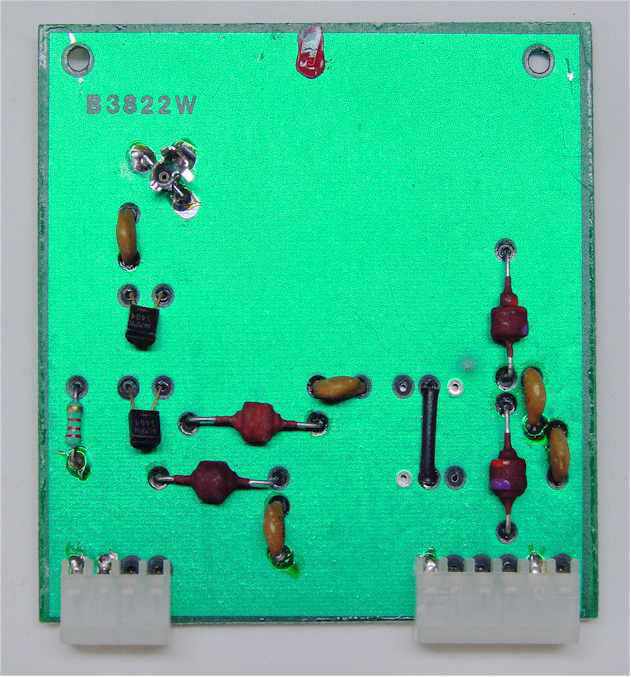 This board provides the same signal switching functions as detailed in the IF Switch Board description. In addition, in the receive mode this board samples the 5.645Mhz IF signal to detect pulsing type noise spikes such as ignition noise generated from a automobile engine. When the noise processor detects noise peaks it turns off the IF amplifier during the spike to eliminate the pulse noise. The noise processor is very effective for short duration noise spikes in the range of 50 milliseconds or less in duration. The IF Selectivity Board servers a dual function depending on transmit or receive. The board is designed to accommodate up to four different crystal filter bandwidths. 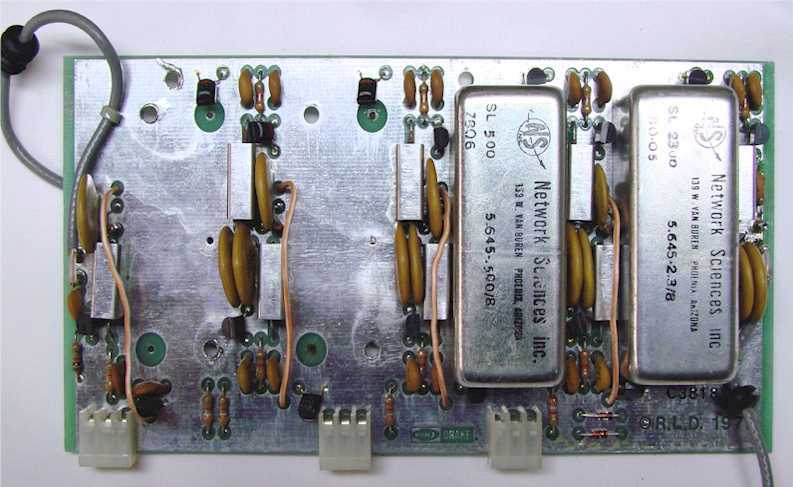 The board comes standard with the 2.3Khz SSB filter mounted in the first position. The other three positions are for accessory filters which were purchased separately and installed by the end-user. The other filters available include a 6Khz or 4Khz AM filter, 1.8Khz RTTY filter (also used for a narrow SSB filter), 1000Hz RTTY filter, 500Hz CW filter and a 250Hz CW filter. Each of the accessory filters were mounted to the board and soldered in place. In the receive mode each of the filters is independently selectable from the front panel push button switches. 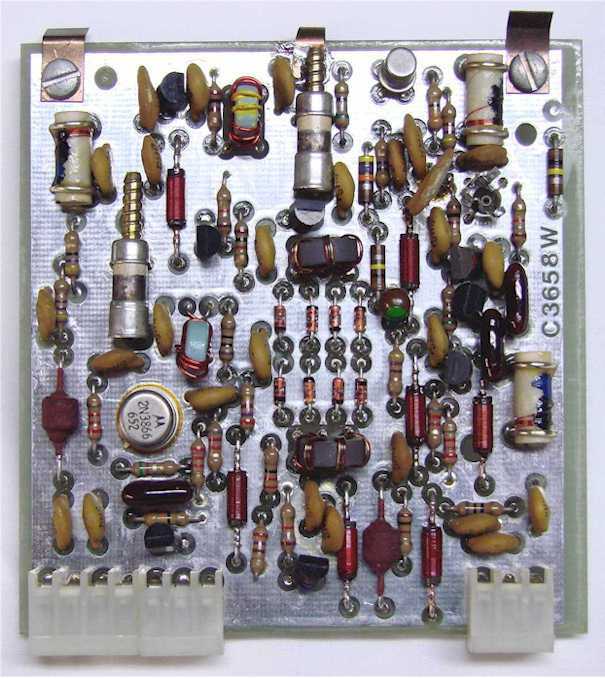 Pictured above this board has mounted to it the SSB filter, far left, and the 500Hz CW Filter in the second position. In the receive mode the board routes the 5.645Mhz IF signal through the selected filter to limit the bandwidth of the received signal according to the mode of operation. In the transmit mode the board was hard wired to only select the SSB filter for all transmitting modes of operation. Note, that went removing the top cover shield, ultimate selectivity of the crystal filter is somewhat compromised due to outside signals leaking around the filter. Make sure the top shield cover is in place for normal operations.